$12 for a $20 Gift Certificate to Buca di Beppo!! 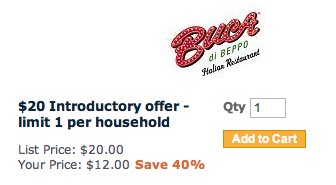 City Deals is offering a $20 Gift Certificate to Buca Di Beppo for $12!!! Also the Sale at City Deals has been extended!! Great for date nights or taking the family out. If your going to go there anyway you might as well have a discounted gift certificate right? If you want to be alerted to daily deals enter your email address.